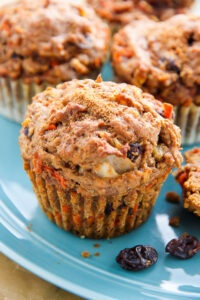 My favorite morning glory muffins are healthy, hearty, and so delicious! 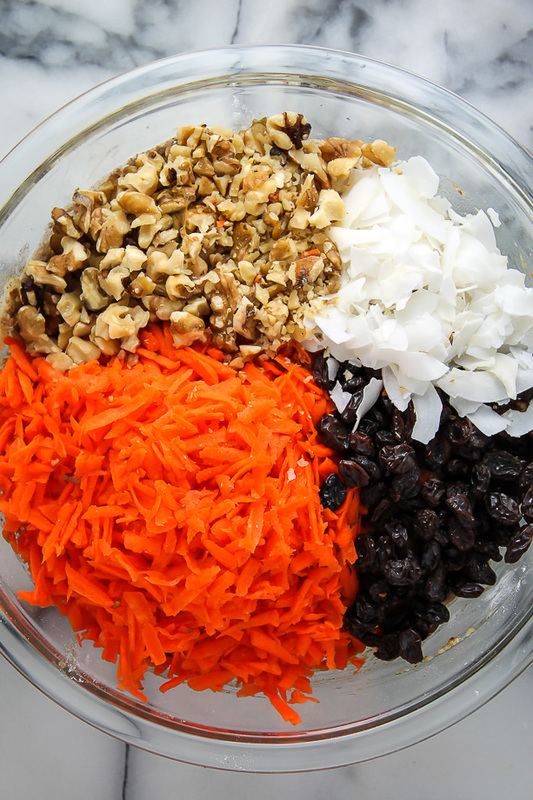 Loaded with carrots, apples, raisins, nuts, and coconut, they’re sure to become one of your new favorite muffin recipes! Perfect for breakfast or as an after-school snack. 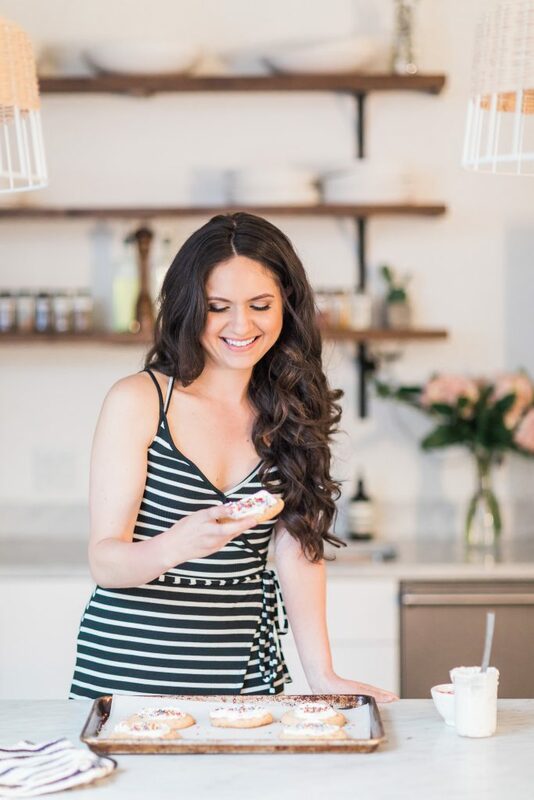 A lot of my friends and family are on health kicks right now, keeping me hot on the hunt for healthy, satisfying recipes that are easy to make and freezer friendly. 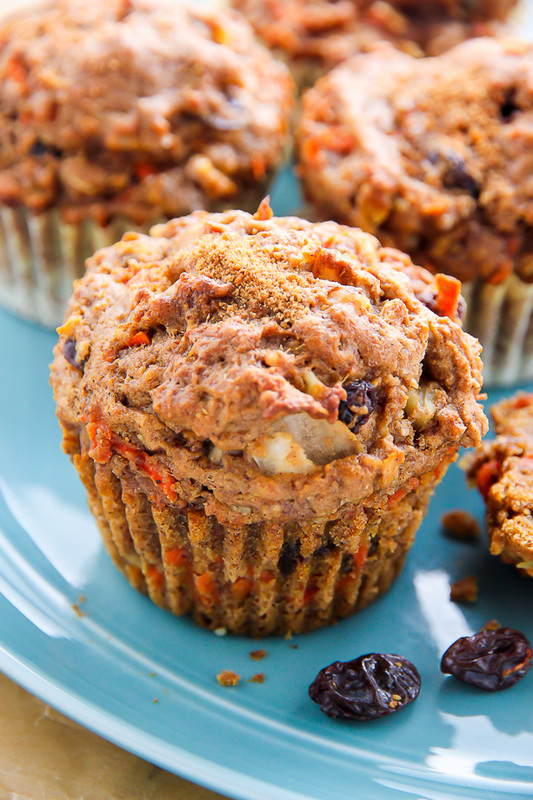 These whole wheat morning glory muffins have quickly become a favorite. 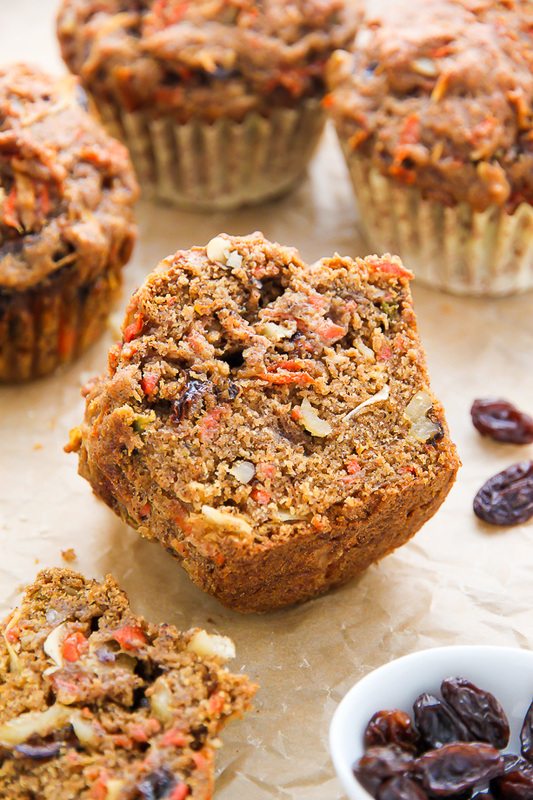 Have you ever had a healthy morning glory muffin before? They’re an old school bakery favorite, and have been one of my favorites since I was a kid. They’re so moist and tender and sweet. Add a cup of coffee and oh mah gosh. HEAVEN. 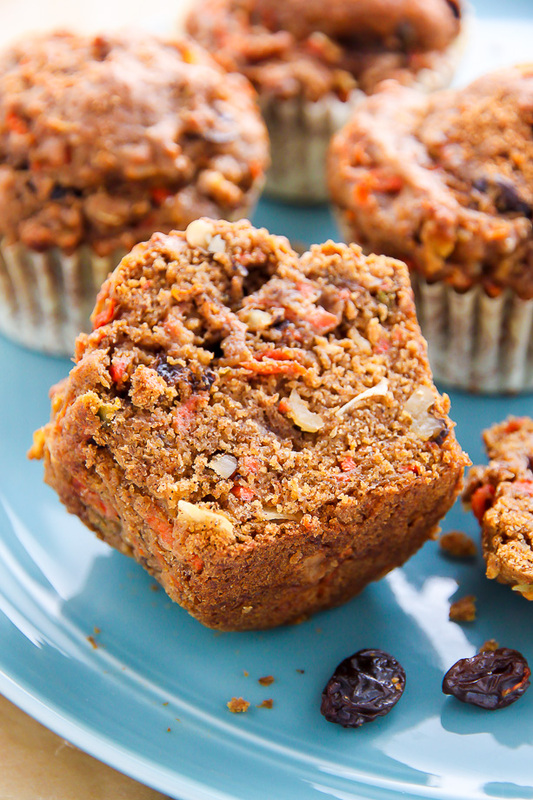 These muffins are made without eggs or any other animal products, so they’re vegan friendly. And tastewise, they’re a cross between a cinnamon apple muffin and carrot cake. So they’re really the best of both worlds!!! These muffins are delightfully adaptable. Don’t like coconut oil? Try using canola oil, or a very mild olive oil. Not a fan of walnuts? Use almonds or pecans instead. No brown sugar in the pantry? Granulated sugar or coconut sugar will work! Hate raisins? Toss in dried cherries or cranberries for a tasty swap. P.S. Unless you have a serious aversion to carrot/apple peels, there’s no need to take that extra step. These muffins are wonderfully rustic like that. Serving a crowd? How about some morning glory MINI muffins. Teeny-tiny, mega tasty, and so stinkin’ cute. Yum!! Made these today and I want to keep making them to have on hand at all times!! Thanks so much for the recipe! And my 10month old approves as well!! My daughter made these and shared. So delish! Going in my ” Go To” recipes. Excellent! Easy tout préparé with kids too! Hi Judy! Great – it’s at the very bottom of this post! Can applesauce replace oil in this recipe ? What if I don’t have wheat flour? These look yum! One question – my bf doesn’t like coconut, do you think I can skip the flakes or is there any replacement you can suggest? Hi Rosie. I think you can just leave them out, no need to add anything in 😉 Enjoy! Yay! So happy to hear you and your fiancé are loving this recipe 🙂 I will have to try them with dried cranberries soon! Do you think I could use spelt flour instead? 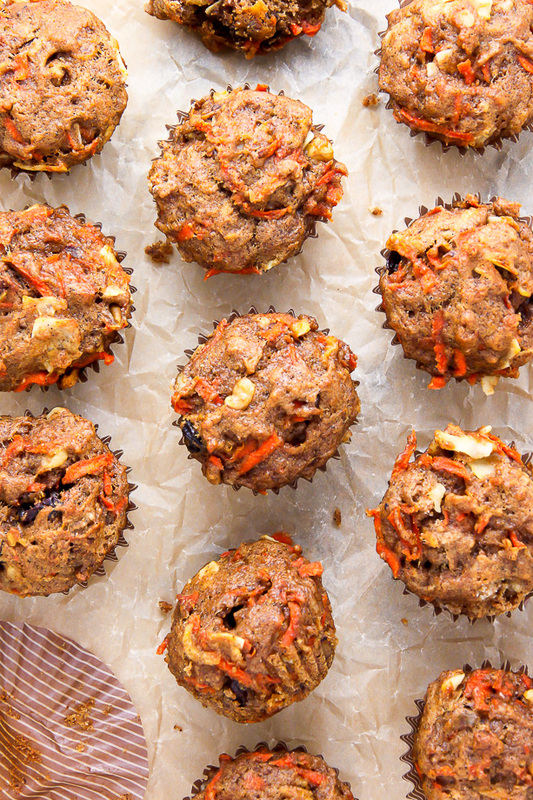 I just made these muffins… SO good! They are really moist and fluffy. I used a cup of whole wheat flour, half a cup of wheat bran and half a cup of chickpea flour, and the result is simply awesome. Thank you for sharing this recipe! Oh my goodness. Literally. These muffins are perfection!!! I didn’t want to get my hopes up because a lot of times vegan muffins tend to be gooey or wet inside or dry, but these are absolutely wonderful! I tasted the batter because it smelled so good and I could tell it was going to be a winner. The flavor, the texture, the moistness, everything is perfect. I just added a little oats to mine because they’re morning muffins, and it seemed appropriate. I am in love with this recipe! Thank you! Oats sound like a great idea! How much did you add?! Thanks! I made your delicious recipe with a few changes. For the grains I used 1c. oats,1/4c. spelt flour,1/4c. 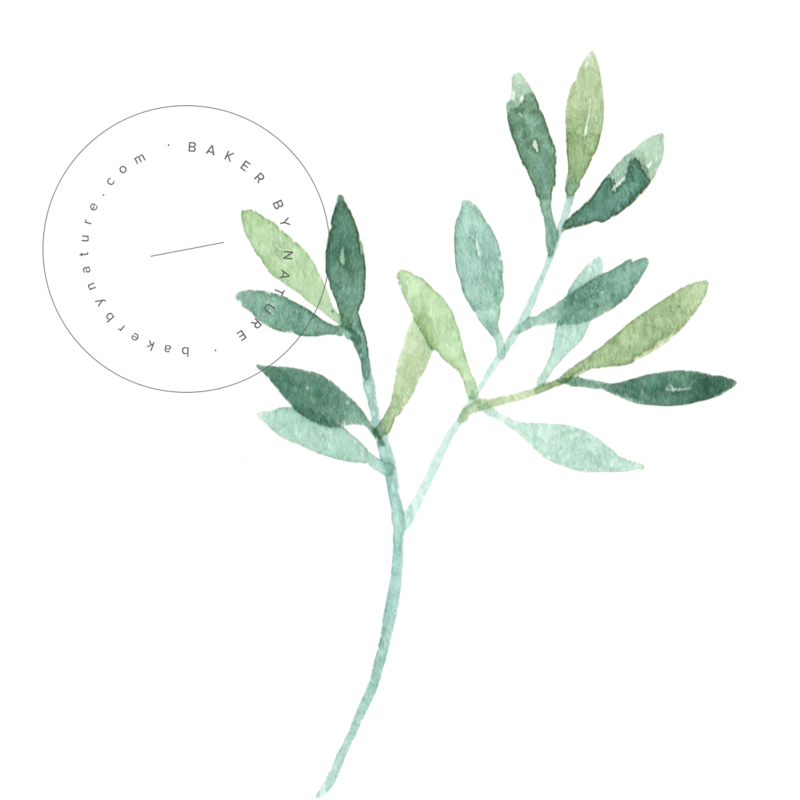 garbanzo bean flour, 1/4c. almond meal, 1/8c. hemp hearts and 1/8c. ground flax seed. I changed out 4 medjool (with 2/3c. water) to sweeten instead of sugar and omitted the applesauce. Instead of muffins I made them in a baking pan and cut them into breakfast squares. They came out so moist and fluffy. Thank you for the wonderful recipe. I made this and absolutely loved them! They are perfect because I spend long days on campus and there’s nothing more filling and exciting than one of these muffins when I’m taking a break from studying. I’m making them again as I speak but I’m making a few changes to make them oil free. Let’s hope they turn out as good as the first round! These look amazing! Can they be frozen? These are by far my new favourite muffin recipe! Loaded with healthy ingredients, easy to make, easy clean up, and they stay moist forever! Thank you! Like bread? And do the muffins freeze well? Could this recipe be made into a loaf like bread and do the muffins freeze well? Hi Wanda. I’ve never tried making this recipe in loaf form, but I think it would work. You’d need to increase the bake time most likely. The muffins do freeze well, for about 2 months. Do you think I could use grated zucchini instead of carrots? We have so many followers I’m our garden right now. Has anyone made this as a bread. If so, how long did you bake it???? Perfect! They came out perfect even if I made a couple substitutions: Spelt flour for the Wholewheat flour; divided the raisins between raisins, dried dates and apricots; used 1/2 c. diced pinneaple instead of apple;and used ONLY 2 tbsp of cane sugar and they are perfectly sweet as is! I love, love, love these muffins! I have made these three times in the last month because they are so delicious and get eaten up so fast. Thank you for the recipe! I got 16 muffins out of the recipe. I estimated about 170 calories a muffin but I did not add shredded coconut and I reduced the sugar to 1/2 cup! I know this is crazy late for this question, but I’m a calorie counting nut and I just had to share lol…these muffins are 423 calories each if you make 12 muffins (which is a great breakfast if you’re on a 2,000 calorie diet)! But if you’re on a 1300-1500 cal diet like me, cut out the coconut flakes and they’re only 283 calories! I’ve been on the search for a healthy smash cupcake for my daughter’s 1st birthday. I’d like to omit the nuts because I have not introduced nuts to her yet. Any suggestions on what to put in their place? Hey Kasey. You could just leave the nuts out, or add extra raisins or cranberries in their place. I made these yesterday and they were great. I did make a few alterations though. Instead of all-purpose flour I used Soy flower to add a little extra protein. I also added a quarter teaspoon allspice and put craisons in addition to the raisons. This seems like a very versatile recipe and I’m going to experiment with it more in the future. Great recipe! Made these today but modified the ingredients a bit: no nuts or coconut, currants instead of raisins and added zucchini, chopped dates and ground flax. Really yummy! Thanks for the recipe! OMG! These muffins are so yummy! I love a recipe where you can follow it exactly and they turn out the way they are supposed to! Made these today, subbed oat flour and used turbinado sugar in place of brown sugar. They are divine! I did have to increase baking time by 10 minutes and they came out beautifully! Excellent vegan/gf muffin! I made theses and they are to die for! But I can’t help but feel like I taste the baking soda or the baking powder. This recipe calls for quite bit of them. Is it possible to add eggs and use less baking soda and baking powder? I have seen a similar recipe with eggs but they don’t use coconut oil or applesauce! And I would like to keep using these. May I substitute gluten free oat flour for the flour in this recipe? Would I need different measurements to do so? We are intolerant to gluten:( I really would love to make this recipe though! Just pulled these out of the oven. DELISH. My fiancé approves too. These will be my breakfast for the next week! Side note, I actually got 15 muffins out of this instead of 12 which is 100% awesome! Thank you for waking my home up to such a wonderful smell!!! This will be one of my go to recipes this fall for sure. We had our first Morning Glory muffins at a Bed and Breakfast in August. Where have these little balls of yummy been all of our lives? Came home and searched for a recipe we could eat guilt free…vegan. Came upon your recipe, and I’ve made them twice. Each try has given me a yield of 20 muffins. These muffins are absolutely wonderful. I’ve shared each batch and everyone loves them. Thank you so much! I made these today but I wanted to make them festive so I substituted a few things and they were so yummy! for apple sauce I used pumpkin puree, for apple I used zucchini and I didn’t end up using raisins or coconut but chocolate chips because I was nervous about them and I figured the chocolate would cover a multitude of sins 😉 (if I do again I will use crasins and orange zest instead) They are so yummy, all thanks to baker by nature. Thanks for the original recipe! Made these as mini muffins. They were delish!! Very moist and flavorful. Do you know what the calorie count & nutritional value is? I skipped a nap to make these: they seem like the perfect breakfast! I just wanted to add that I followed the ingredients exactly, but it made 20 regular muffins. Huh? I know they’all get eaten, but wonder if I did something wrong…. I am practically famous in my family now because of these muffins. So deliciously wonderful, thanks for sharing! We made these catering and quadrupled the recipe, such a hit with breakfast! We had extra batter and ended up adding oats and making cookies. The cookies were fantastic on their own- but even better drizzled with a German Chocolate Frosting! My morning glory muffins didn’t really rise much. Are they supposed to? Hi Ro. These muffins do not rise as much as regular muffins, so you can fill the tin all the way up. I didnt realize these were vegan until after i mad them lol!!! they are my favorite muffin recipe i have ever found thanks!! I hardly leave reviews for recipes that miss the mark I just don’t try anything from the site again. But I’m curious how everyone got ‘great’ muffins from this recipe. Halfway through mixing it I realized There is NO liquid in the mix, unless I missed something?….how is 1/2c of oil enough liquid for 2c of flour, especially whole wheat??? Before I even added the carrot I could barely mix it, it was soo stiff. I am a very good cook and baker and I can make adjustments to recipes if needed. Of course I had to bake it longer which was fine. I prefer moist muffins so I think the sour cream really helped. I will say I love versatile recipes so this has that advantage. and liked that I was able to make the adjustments to get them to taste how I preferred without wasting ingredients. I think otherwise they would’ve been hard as a rock. Did you miss the applesauce? They are very very moist even without the liquid. I had no issues with them. Yes the batter was very thick, but it worked out in the end. I made these last weekend & they were delicious! My batter did make 14 very full muffins, but I’m not complaining about extras! Today I’m going to try subbing in blueberries somehow so that may be an interesting twist! Thanks so much for the recipe! You can pop it in myfitnesspal website in the recipe section, for those asking, just copy/paste the link to this webpage & it’ll calculate the total calories, etc. Thanks for a great, healthy, muffin recipe!! I love all the ingredients but they didn’t come out looking as pretty as the picture lol ! I used a little coconut flour instead of all purpose flour !! An I added dates instead of sugar but I think will try with the brown sugar … I added an egg cuz it was dry ! But they still were fluffy ! What did I do wrong ? Or are the just extremely healthy lol ? Hi Tina. The changes you made are most likely the reason the muffins tasted and looked much different than the ones in my photos. I recommend sticking to the recipe as is for best results. These are great muffins and I will definitely make them again!! I didnt’t have coconut oil yesterday so I used canola oil. I did buy coconut oil now so I am anxious to make them again. They were very moist and gave some to my mom and sister today and they really liked them!! Also, took them to bingo last night and shared with some friends and they liked them too!! Thanks for sharing!! I love the recipe and it’s healthy too!! Hi, bakerbynature! I just made these with my kids and we are eating them as I type. It just so happened that I already had all the ingredients in my kitchen. As I was mixing everything I wondered if the muffins would be too dry but they are pleasantly moist and tasty, especially inside. My kids approved on everything except the coconut chips and I think they would have been good had I placed them in my food processor to make them less bulky. I did this with the carrots as well and they most certainly would have pulled those out along with the chips had I not processed them. So, this is a was a really good way to sneak in some fiber for them! I will definitely make these in the future. Thanks for a yummy breakfast! These are wonderful muffin! I doubled the batch because I was so confident after reading all the responses and I was not disappointed. I reduced the sugar to 1/2 c. (1 c. For my double batch) and accidentally forgot the vanilla and neither omission was noticed. I will be making them again soon as I love to keep muffins in the freezer so that I can take one or two out the night before the morning I will enjoy them. I’m so happy to hear it, Christy! How do you store these muffins? Can you sub coconut flour for regular flour? First, I had homemade apple butter on hand from a recipe I’d made earlier in the week, so I used that in place of apple sauce and had to add 1 cup homemade cashew milk because the batter was more like a dough. Then, I didn’t have enough carrots so I subbed half a beet for roughage. Finally, I chopped some slivered almonds and used half of those and half chopped walnuts instead of all chopped walnuts. I added some coconut shreds to adorn the top of these babies, and had some batter left to make two soufflé muffins with! Threw some Earth Balance butter on while they were warm and they melted in my mouth. So delicious, definitely keeping these around as a frequent flyer in our kitchen! This recipe is now saved and in my recipe box! They are so yummy! Only change I made was using coconut sugar (instead of brown). They turned out great! And my whole family loves them too! 🙂 Thank you! Hi Candace. Sadly, I have very little experience with GF baking, so I’m not sure what changes would need to be made. I think a 1 for 1 GF flour would be the best bet, since I’ve heard many have success with them. @Candace. I Made these into a gluten free version as I have hashimotos aswell. My GF version was Very easy. Swapped the wheat flour was 1 and 1/2 cups of coconut flour and I used 1/2 cup of gluten free all purpose flour instead of the normal flour. The Baking soda and bi carb is naturally Gluten free. Yay. I also used apple puree instead of apple sauce as they often hide gluten derivatives in the sauces. Other changes I made purely because of what I had on hand: Swapped the ground ginger for 1 tsp of minced ginger. It was Just enough. Shredded coconut instead of flaked. I also ground up the walnuts instead of just chopping as I like my nuts smaller. I had to cook these for 20minutes longer due to the denser flour conposition. They were Bloody beautiful. This is the first muffin recipe I made. Both my husband and I love it! They’re not too sweet and very moist. For sure I will make more in the future and try some modifications. Thanks for sharing the recipe! These are probably my most favorite muffins that I’ve ever had!!!! My roommate and I make them constantly. They are such a healthy snack to have around we bake them every other week pretty much!! They’re very adaptable. I substitute the oil for pumpkin puree and this time I’m trying it with pineapple pieces instead of shredded Apple.. will see how it turns out!! 🙂 Thanks so much for the recipe it’s my favorite!!! Perfect every time! I made these this morning. They were delicious! I added pineapple. I omitted the coconut. I did a little less AP flour. My Applesauce wasn’t unsweetened. It was spur of the moment. I will definitely make these again. I’m going to make these this week! They look great!! I read all the comments though and didn’t see any answers to how best to store them or how best to freeze them. This would be super helpful to know as I’m planning on baking them on Wednesday and then having them ready for my in-laws on Sunday. I’d like to freeze them and then thaw. Should they be thawed over night on the counter? I made these subbing gluten free flour, 2 cups and used 1/4 cup less sugar. I also added a dash of ground cloves and nutmeg because the spice bin was open, and why not! They taste delicious, especially with pumpkin butter on them! Yum! I’ve made 3 batches of these so far and plan on always having them in my freezer to grab & go! I’ve started calling them “yoga muffins” because I always have one waiting in my car for after class! They’re perfect, and sooo healthy~ The only thing I do different is to grind up oatmeal and use it in place of that 1/2 cup of white flour, and maybe add pecans instead of walnuts if I have none on hand. Yummy! Thanks so much for the recipe. 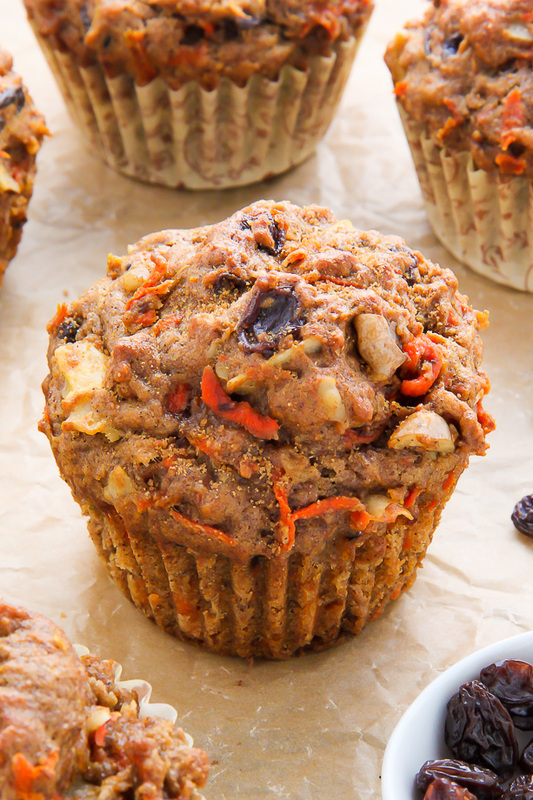 How many calories are in these morning glory muffins? The nutrition information is not displayed on the page. Thanks. 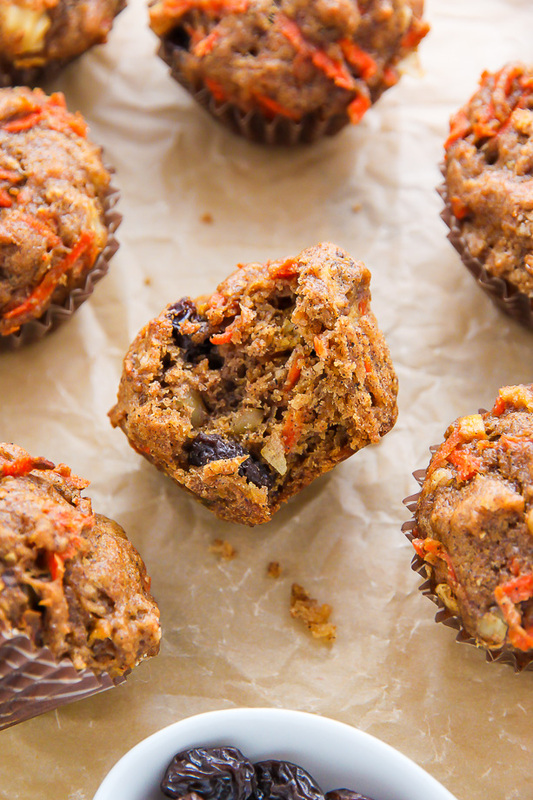 These have become our favourite muffins for breakfast, lunches and snacks during hiking trips. I have 2 versions that I adapted, in one I substitute All-Bran cereal for the 1.5 cups of whole wheat flour. In the other, I substitute a cup of crushed/drained canned pineapple for a cup of the carrots. Both are so delicious!! I’ve also made a version where I used quinoa flour instead of the white flour. All of the versions above make for a very dense muffin (as they don’t rise much) and all freeze equally well. These were good, but am cutting sugar, oil and cinnamon by half next time. These are too much like cake to call them healthy. Hi Hannah. I’m glad you enjoyed the recipe. And I look forward to hearing how your adaptions go! Just beware, reducing the oil and sugar will dramatically change the taste and texture of the muffins. Sitting in my Florida room on a cool weather day, I did your morning glory muffins, just having one with a cup of tea, incredeble how good they are. They will be from now on my favorite muffins. Thank you for this delicious recipe. I’ve made these 3 times now and they have been awesome every time. I don’t make any changes to the recipe and they turn out great! I had my first carrot muffin at the hospital at Vanderbilt University when my son was there for heart surgery. I would get so upset each day if they were out of them! I hunted for a recipe as soon as we were back home and found this one. Now, I just make my own instead of making the 6 hour drive. Thanks for sharing this receipt, I did not make any changes and it was perfact, moist and tasty. My husband give them a five star. Thanks again. Dawn G.
How many muffins does this recipe make and how full do you fill the muffin cups? Tried these out this morning, so glad I did! Have a family member going through chemo, and he was thrilled to find something healthy he wanted to eat! Used fresh ginger as we both love the taste, but followed the rest of the recipe as listed. Soooo good!!! Thank you for sharing! I was looking for the nutrition facts but there are none. I love all the healthy ingredients! I found the final product to have a strong baking powder/soda taste. I would omit the salt in hopes to cut down on the baking powder/soda taste (assuming the recipe needs that much rising aid?). A slice of cheese or butter somehow counteracts the soda/powder. Not sure why because those are salt too! How many muffins does one recipe make? Thanks! So many comments on an amazing muffin recipe.. but a few edits to the recipe that I would suggest. Change baking instructions – 20 minutes at 375 does the same as the method stipulated. Honestly the best muffins I have ever made hands down ! Made these today. The mixture was unmixable upon adding the oil, apple, apple sauce, and vanilla. Holding out hope I tried as best As i could and then added the carrot,hoping they would moisten it enough to turn it into proper batter. Unfortunately, it remain dry and doughy. I used about a cup of cashew milk to make it more of a muffin batter texture. As a result, I now have 24 muffins, all of which are gooey, bad-gooey in the center. I wonder if perhaps 2 cups of flour is too much to have so little moisture. I will likely make them again, using less flour and without the milk. They taste amazing, though, so I will not be giving up just yet. Delicious muffins!! I followed the recipe exactly and they turned out great. Just curious how you store your muffins. Would they be okay out of the fridge for a couple days? I wanted to take some on an upcoming backpacking trip and wanted to make sure they would be ok out of the fridge for a few days.? Please let me know what you think. Best muffins ever…can’t believe people try to change the recipe …perfect as is! Just about to gather ingredients and discovered I only have fresh ginger, will that work? I’ve been making these for awhile now and we absolutely love them. My husband doesn’t even realize that they are actually quite healthy. I can’t make enough of them, he gobbles them up! I made these for my family that makes fun of vegan food. They loved them and said they were the best Morning Glory muffins they have ever had. Then I dropped the bomb on them that they were vegan . I did use Nutiva butter flavored coconut oil. How many muffins does this recipe yield? Thank you for this recipe. They are so moist and delicious! I followed the recipe exactly and am so confused by the pictures and the comments! They didn’t turn out anything like the pictures look, or taste that good. I’ve checked at least five times that I didn’t forget to add anything! The batter was not like a muffin batter, quite stiff and thick – almost like a dense cookie dough batter. The muffins don’t rise at all, and are very dry. I’m thinking they need some extra form of liquid. Any thoughts on what may be going on? The pictures look so goood! Made these today with my daughter…absolutely yummy. Just get a slight baking soda taste as you eat. Can you adjust to less raising agent? I didn’t add the coconut. Instead added a handful of oats. Also some comments mention substituting the oil with pumpkin purée – does that work? What else can you substitute the oil with? Thank you for sharing your wonderful recipe. I followed the recipe and they turned out looking just like yours. I got 15 full muffins. Delicious! I cut down sugar to 1/2 cup and substituted homecanned zucchini ‘pineapple’ for the apple with a little of the juice as the batter seemed a bit dry and pecans. This muffin has a wonderful texture. Hi! I have been making these for at least 3 years now. SO good! The nutritional information is not listed. Do you know how many carbs per serving? I am training for a marathon and thought these might work as obe of my snacks. The gial us to consume about 30 grams carb per hour. The gels really kind of creep me out and I would like to try and eat as much real food as possible. And these would be a total treat!! Thank you! Has anyone tried making these in a large muffin tin as opposed to a normal size one?? And if so, what baking time/temp did you do? They’re too good to be true! I made them and I love them. They’re gooey right out of the oven they they fire up for lunches. This recipe makes 2 dozen. How many calories are in each? These are the BEST morning glory muffins I have EVER !-:!! Will definitely be a “go-to” recipe in the future!! Best ever! Hubby loves them! I made these two days ago and they are my new favourite muffin!! I will make more again but eliminate the nuts so my daughter can take them to school. Love them!!! HI! This recipe looks amazing!!! I was wondering what the nutritional information is for these muffins? Specifically the sugar, fiber, and protein. Thanks so much! No words! These are soooo good. They might not last until tomorrow!! I made these for work this morning. Put the dry ingredients in a bowl last night to save a step this morning. I thought I had bought wheat flour but it was a small bag of white. Came out great! Will make thee often. Husband loved them too. Looking forward to making these for company breakfast. Thank you Ashley! Your recipes are always so delicious. Love your book too!!! This receipe is incredible. My kids loved them!!! Thanks! Just made these muffins for my college age grandson. They had a very nice flavor and were extremely moist. I used white flour as that’s what I had on hand. Also, the recipe calls for an apple, shredded. I used a small Gala apple. My recipe made 24 full muffin cups. Will definitely make them again. Just discovered this recipe and it is a major hit in my house! 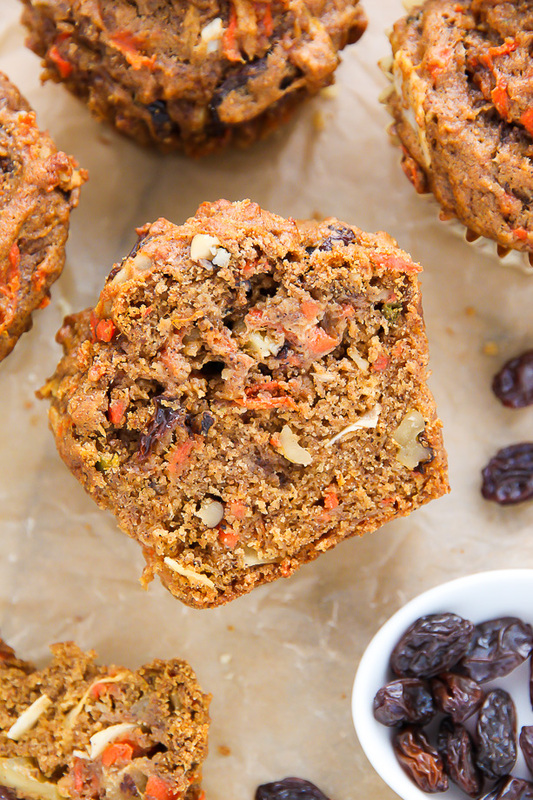 We love the fact that these muffins are packed with a ton of wholesome, REAL ingredients! We have eliminated refined sugars in our home so I used raw coconut sugar instead of brown sugar and lessened the amount by a third (roughly). I also used organic, dried, unsweetened cherries instead of raisins and pecans instead of walnuts. Thank you for the wonderful recipe!! A perfect recipe for all. I love the texture, the taste, and the healthy ingredients! My kids and their friends love them and can’t believe they are vegan, This time I have made a double batch so I have some for the freezer. Thanks so much! Hello. Made these muffins yesterday. They are fabulous! Do you happen to know the calorie count for each muffin? Just like the other comments I also Love these muffins and have been making them every week since I found the recipe. Many people have asked about the calories, carbs, etc. Did we ever get and answer because I would also like to know. The nutrition guide posted doesn’t tell you anything. It would be so awesome if someone would figure it out. These looks so good! Adding these to my baking list!